Armadillo Aerospace is currently a NewSpace research and development company in the Aerospace industry. In the near term, Armadillo's goal is in developing a suborbital spacecraft capable of manned spaceflight. They hope to use this capability for space tourism. Their long term goal is manned orbital spaceflight. True to their name an armadillo named "Widget" is the company mascot. The company was founded by John Carmack in 2000. He currently personally funds and runs the company. John Carmack is a developer of interactive computer games. Games he has developed include Doom and Quake. As of March 2007, all employees working on Armadillo projects were volunteers. In their own words: "Armadillo Aerospace is a small research and development team working on computer-controlled LOX/ethanol rocket vehicles, with an eye towards manned suborbital vehicle development in the coming years." The company's current R&D practices are best summed up by "build a little, test a little" This has created a rapid development cycle within Armadillo Aerospace. The company has been very good at keeping the NewSpace development community updated on their progress and expectations. The company's website has a great deal of detail on almost every aspect of their activities. Armadillo is currently developing vehicles to compete in the 2007 Lunar Lander Challenge as part of NASA's Centennial Challenges. Armadillo's current vehicles that they are using in NASA's Centennial Challenges, are called "Pixel" and "Trexel". 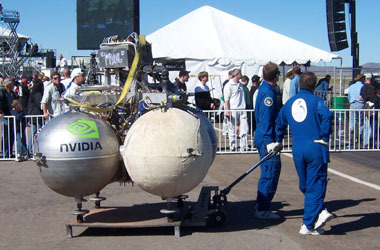 Armadillo Aerospace's "Pixil", getting ready to fly, at the 2006 X Prize event in New Mexico. First Rocket Test Flight July 2001? X Prize Cup October 2005 - One test flight at the event of a engineering test rocket. Armadillo plans to compete in the 2007 X Prize event, October 2007, in New Mexico, USA. SpaceX - Space Exploratino Technologies, NewSpace company working on private orbital flight. Scaled Composites - Winner of the first X Prize. This page was last modified 09:00, 14 May 2009.